I love using lemons in my kitchen, and frankly just having a few lemons in the kitchen give it a warm, cozy look. But with the price range from 50-75 cents a lemon a la carte, it's better to buy a bulk bag all at once. At least that seems like a good idea, until you find you've got four lemons left to go and they're all drying up into rock-hard spheres with the rind of a golf ball. To be fair, at least you can still get some juice out of the lemons when they go downhill like this. It's not like a clementine, which looks fine on day one, then is 30% covered in a powdery, blue-grey mold the next morning. So I find the best way to use up a bulk bag of lemons is to hedge my bets; keep some fresh and preserve the rest. This gives you the savings of a larger bag, without the nagging guilt to use up 8-10 lemons in the next three days. This preservation method is based on a Moroccan and Tunisian recipe, where the lemons are used to seasons tangines, roasts, and couscous. The recipe is simple: combine lemons and salt. Really, that's pretty much it. Many store-bought jars of Moroccan lemons show the lemons floating in a salt water brine, but the problem with a brine is that you cannot tell the salinity by eye. 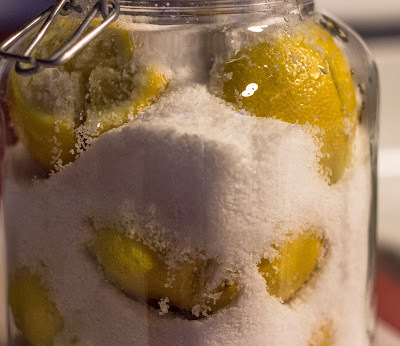 By packing the lemons in kosher salt (not table salt, which will give it a nasty iodine flavor), you can easily see that the lemons are completely covered in salt. Plus, when you get more lemons, you can add them in to the curing jar and just add more salt. 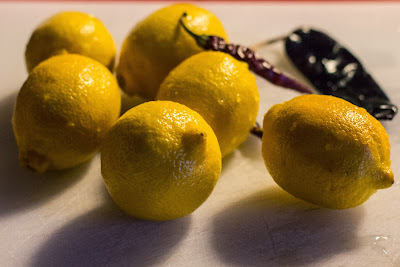 These preserved lemons lose their bitter, pithy taste, and have a unique citrus note that's not bright like a fresh lemon, but deep and savory, on par with a flavoring like bay. You can also add some chile peppers to the salt to add a bit of heat. To prep the lemons, give them a good scrub, then cut off one end. Make a cross cut into the flesh of the lemon, but leaving the remaining end intact so it doesn't fall apart. Pour some salt into the core of the lemon, and then pack them in a jar with more salt. They'll absorb some of the salt and soften up after a day or so, at which point you'll need to top it up with more salt to keep them covered. Preserved like this, they'll be ready to use in a month, and take on a softly opaque color to their skin. This lets you know the "ripe" lemons from the newer ones that still need some time in the cure. Then, when its time to use one, just rinse off the salt, cut out the dessicated innards, and mince up the flavorful rind.